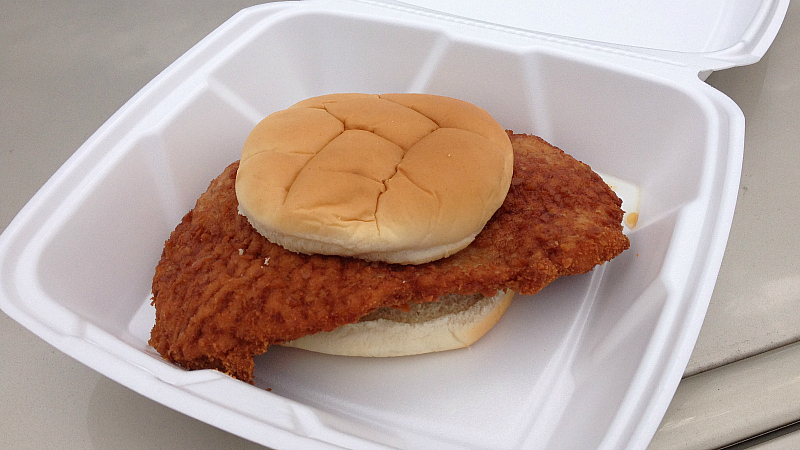 A review on Urbanspoon recommending the tenderloin at this small town brought Ford's Pub to my attention a few years ago. The sign reads "The Place to Meet and Eat!" and has a graphic of a beer mug and a burger. 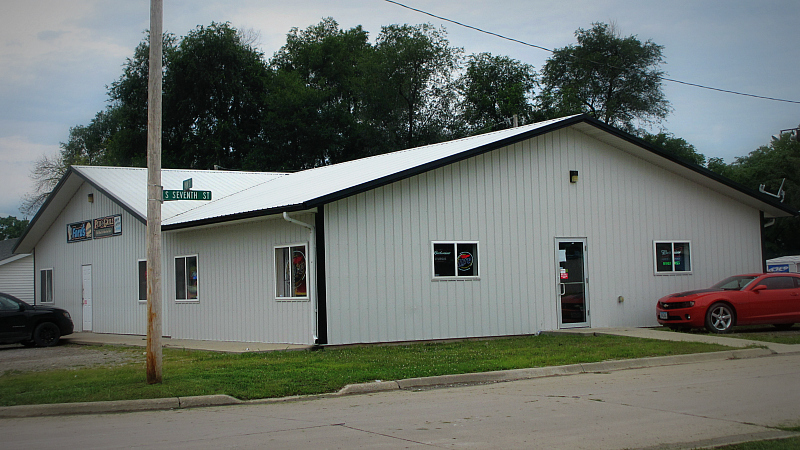 Location: 603 Main St in Eddyville in Wapello County between Ottumwa and Oskaloosa in Central Iowa. Directions: Eddyville is reached from Highway 163 and Fords pub can be found by taking the offramp and finding the corner of seventh street and Main. 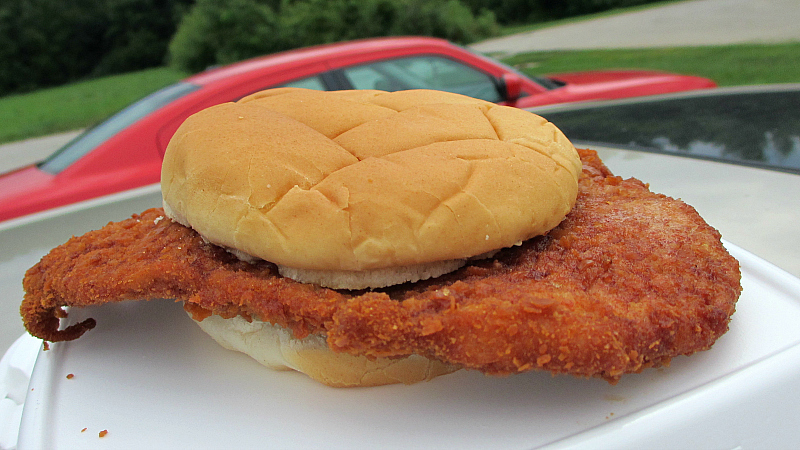 The Tenderloin: The crackerlike breading formed a consistent and thin layer of crunchiness to the entire loin. It took a nice shade of golden brown on each of my visits. The trim job wasn't perfect, but that didn't bother me this time. The inside was warm and juicy white loin meat. The cut of loin meat took a roughly triangular shape. Overall 8.1 out of ten. Also on the menu: This was mostly the usual bar food of burgers and fried stuff, one of their burgers is named the Oinker Burger. The Whole Hog: I tried this a while back, a breaded tenderloin topped with sliced ham, bacon, melted cheese, and barbecue sauce. 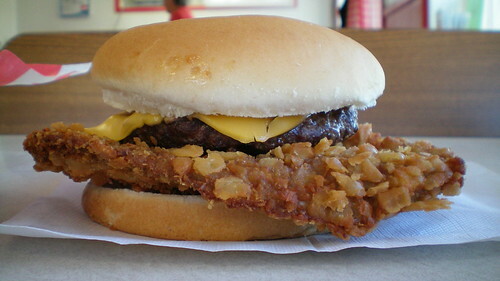 Served on texas toast, this was worth the extra two dollars if you are really hungry. Service: It was bar service and I just stayed at the bar on my two visits. Ambiance: this is a large bar and grill for a small town like Eddyville. The walls are covered in beer signs or various sports gear including a large area dedicated to Oskaloosa native Tyler Sash. 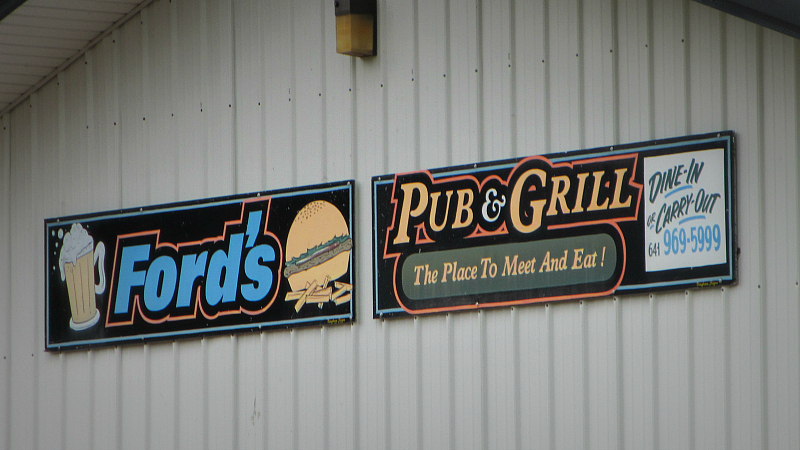 Final Thoughts: I could not help but notice the miniature dirt racing track next door to Ford's Pub. Its like a dirt track that people race stock cars on, but its really tiny. Do they race bumper cars on it? My internet searching only brought me to a drag strip outside of town.